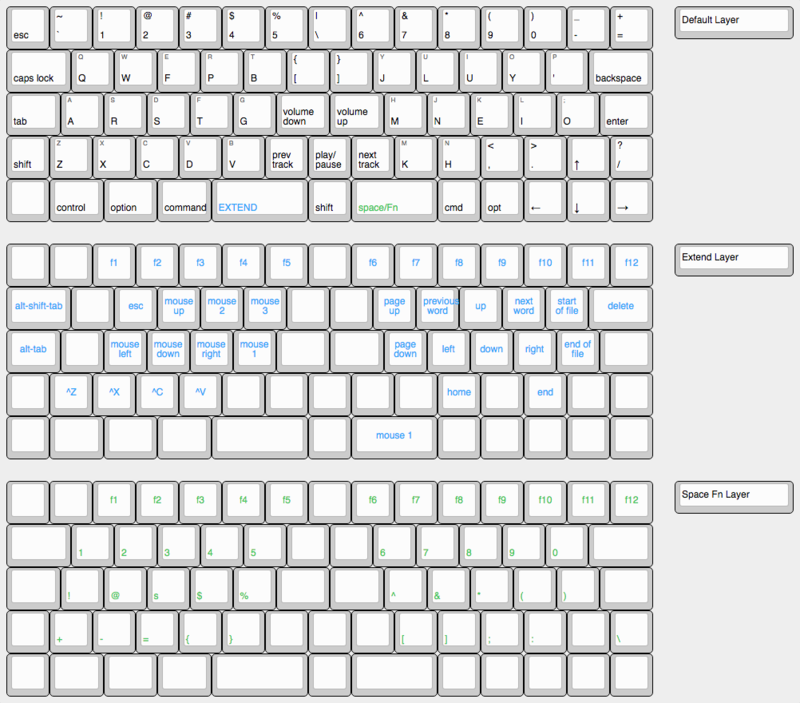 Katana60 - the 60% compatible ergonomic layout I've been developing for a while now - will soon be available to buy. Although I have a default layout - which can be found here - I'd like to make further improvements. I'm starting this thread in the hope that others can contribute to the goal, in particular I'd like to adopt some ideas from DreymaR's bag of tricks. Add your suggestions, comments, ideas - both on the Katana60 and possible layouts. That looks like a good position for the Extend key, which should be easily accessible with the left thumb. But apart from that, the actual mappings don't seem to give you much benefit: some easier symbols like ! and $, and the number row is slightly nearer. But that's small potatoes compared to what Extend can give you. IMO the key to unlocking the wonderfulness of Extend is navigation. That means you need arrow keys on the right, probably on IJKL. Also probably shift and control as modifiers on the left-hand home keys, as per DreymaR's mappings. Maybe you could use that central shift with your right thumb in conjunction with Extend but it might be a bit of a stretch. I'd probably have Shift on one of those two command keys. Shift is so frequent that it needs a good location, and this keyboard with it's excellent bottom row is perfect for an improved Shift. I'd definitely go for something much closer to DreymaR's. Or you could take a look at my Extend layer which is similiar. I've been using the space bar as a layer switch when held down (there is a small delay before the layer kicks in, which although very short, takes some getting used to. It's fine once you're there!). I borrowed this idea from the TextBlade (will it EVER see the light of day?) layout, that keyboard only has 3 rows of keys plus the space bar, so it makes sense to place numbers and symbols on an easy-to-reach home row layer. Much as I like it, I appreciate the added row for numbers and even the arrow keys. You can link to Imgur images? On Imgur, right-click the image and select 'copy image location'. Then paste that URL in img tags here. Works for me! • The lack of home row Extend Alt/Ctrl/Shift keys means you lose the powerful combos of true Extend. • For instance, I have Home/End where you have your Next/Prev Word keys. – Not sure how you did those, Ctrl+Right/Left mapped to the L/Y keys? – Similarly, End of File is Ext+T+Y. It's one more key press than your dedicated button, but simpler to remember and more open to combos. • Multimedia keys aren't used that often, so they don't quite deserve to be smack dab in the middle of things? Well, with multiple layers it's okay I guess. • Key mousing doesn't work well enough for a central placement in my opinion. What does work well is WheelUp/Down (scrolling) and MouseButton1/2. • Whether to use a number row like yours or a NumPad like mine is a matter of preference I guess. The NumPad could be very fast and comfy, but takes some training. As to your alternative arrow key placement, it really shouldn't matter much as I hardly ever use the physical arrow keys any more. It's Extend arrows (plus Ctrl, Shift etc) all the way except when I use only one hand! I do, however, strongly recommend your alternative setup as separating the /? key from the others is a bad thing! Great feedback DreymaR, exactly the kind of detail I hoped I would get, thanks man! Not sure how you did those, Ctrl+Right/Left mapped to the L/Y keys? I'm a MacOS user, option + left or right will move the cursor to the start of the previous word or the end of the next word. Using QMK, I have bound these to Extend - L and Y (I'm pretty sure there is a Windows equivalent - ctrl perhaps? Am I right?). By holding Extend - shift - L or Y, I can select the previous/next word respectively - so selection is perfectly achievable. Multimedia keys aren't used that often, so they don't quite deserve to be smack dab in the middle of things? Well, with multiple layers it's okay I guess. so perhaps it is better to keep those as THE default for most users (and move multimedia keys to the extend and/or function layer). I can't help but think that the added navigation options around the right hand on the Extend layer means they aren't need as dedicated buttons any more? I guess this part is down to preference. I totally agree - Unless there is a trackpoint or similarly responsive input device, I think the qmk implementation of mouse movement is shaky at best. Whether to use a number row like yours or a NumPad like mine is a matter of preference I guess. The NumPad could be very fast and comfy, but takes some training. Actually, I have considered adding a num lock toggle button for this purpose! The ideal position imo would be the back-slash key (between the 5 and 6 on the number row) - of course a back light to indicate that it's on would be ideal, but maybe that's something for the second revision of the PCB? I do, however, strongly recommend your alternative setup as separating the /? key from the others is a bad thing! I had to move the '\ |' key from it's usual far right position to the far left, where the tab usually resides. I also rearranged the left hand extend keys to reflect what I've been using for a while (since I can't imaging the mouse keys bing that useful). I like the way this is coming together already, especially since I can use more keycaps with existing legends! I see that you're still not sold on the power of modifier combos. So be it, maybe. For yourself, you may find it easy enough to remember where you put all those different keys for selecting whole words and passages and whatnot. And you may not need to have as much in one layer as I do in my Extend layer so using up a bunch of keys for these functions may not be an issue for you. I tend to try and see the bigger picture in which others have to learn my layouts too. And in this case, having home row Shift and Control combos with the Extend keys is invaluable. Not only will it allow the user to select the next paragraph (Ext+S+T+Y for Shift+Ctrl+End) without having to remember where the key for that is, but it will train combos that may be used on non-Extend boards too – although far less ergonomically of course. I agree that for instance Ext+J/K as PgUp/PgDn and Ext+L/Y as Home/End pretty much buries the need for physical nav keys in the middle. Not entirely sure what would be good on those. I think your setup with Home/End on top of each other looks bad but that may be only because I'm so used to having them horizontally stacked. To me it makes much more sense, as their default mode is going to the left/right of the line! Again, I find their Extend placement pretty much perfect. They're way more useful than many realize I think. To reiterate my argument: I firmly believe that in an editing situation the true power of Extend lies in having the needed navigation and editing tools very near your home position! Arrows, Back/Del and Home/End are crucial, and PgUp/PgDn nice. These are multiplied tenfold in utility by the Shift and Ctrl keys also on the home position. This is the core of true Extend power, that has escaped most makers of Fn layers I've seen. I SEE it now, having shift on the home row is a big deal, and I would need to check the MacOS equivalents for certain shortcuts, since I already have all the ones you used in your BoT. In fact, by removing many of the mouse functions I have made room for additional navigation shortcuts (which means I may not need the 'ctrl' oh the home row - though for Windows compatibility its better to keep it in). Also, I quite like the idea of extend + ; being the 'backspace' key, but rather than extend + p being 'delete', I would move that down to / instead, since I feel curling the pinkie in is better than stretching it out. This is where you have the 'cmp' button on your navigation layer. What does that do exactly? I used the suggested layers above, and then I moved the position of the extend to your suggested position on the right of the home row, and I really prefer that. This also means I can use the second of the two space 'bars' as a backspace - which I find invaluable. I'm not entirely sure what the best option is for the central key, but I'm trying 'enter' for this position. It's especially useful in this position when mousing with the right hand and 'keying' with the left. Although there is a nice symmetry to positioning the number pad with respect to the num-lock and 0/ins keys, positioning them on the home row is far more comfortable. The layout of the layers is now synergising VERY WELL with the key positions on the board. The Katana60 is such a joy to use man! A NumPad is primarily for speedy entry of multiple numbers. What's very important is to stay within the design idea of physical NumPads as people will be used to those and some are even trained to use them expertly. Also because their design is actually good for their purpose. So your double plus key works well enough. But take a close look at my NumPad Extend layer! • The concept of keeping the 789 for the NumPad (for better anchoring) is of course debatable. I see why you didn't do that. • Why do you promote a hand shift to the right from the home position though? Bad idea! • Furthermore, the fat zero key is important! It's for writing bigrams like 00/10/01/20/02 smoothly. These are common. – So you really need to put the NumPad directly above the zero key as on the physical pad. Which means a shift left, not right! • In any case, you need the NumPad Return key to the right of 3 as on the physical pad. I've tried it and it works well enough. • I see that this borks your brackets which are damn useful on a NumPad, so there's an issue. But I still think it's the way to go. 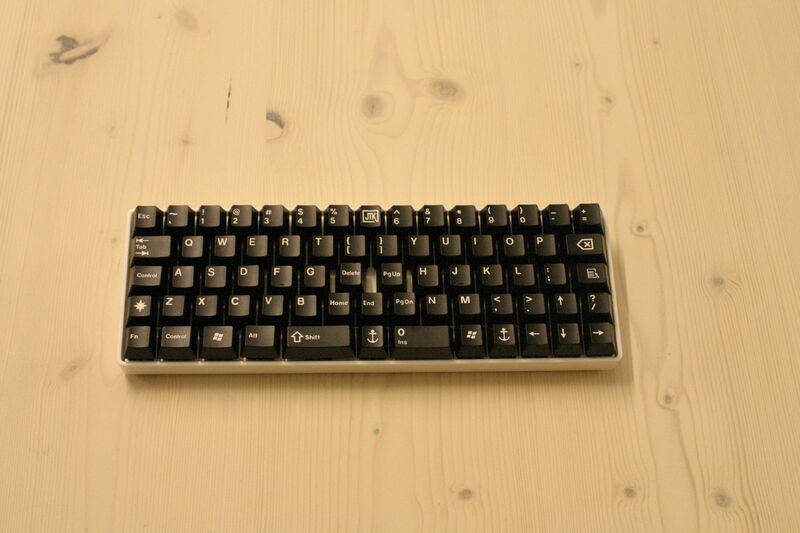 • One alternative would be to forgo using your fat key for NumPad zero and instead make it a double key like I did. – Then, you could just not shift to the right and keep the brackets and PgUp/Dn keys again.